From the antioxidant benefits of tomatoes to “the incredible edible egg”, people are turning from fad diets and processed foods to more natural, wholesome fare. Health-conscious people are also resorting to homeopathic remedies for common aches and pains, as well as more natural alternatives for skincare. One of the most overlooked resources for wellness both inside and out is the common cucumber. This garden staple has become a standard for fragrances, bath products and aromatherapy, but the nutritional benefits have historically been overlooked in favor of more savory, colorful foods. It may be surprising to find this produce-aisle standard is a veritable treasure trove of nutrients and minerals necessary to good health and wellness. Cucumbers contain most of the vitamins needed to meet standard recommended daily nutritional needs. Just one cucumber contains vitamin B1, vitamin B2, vitamin B3, Vitamin B5, Vitamin B6, folic acid, vitamin C, calcium, iron, magnesium, phosphorus, potassium and zinc. According to the National Institutes of Health, each of the nutrients the cucumber provides is essential to good health. Vitamin B6 is essential for proper nervous- and immune-system functionality. Vitamin B12 is important for nerve and blood function and is involved with the production of DNA. Magnesium is one of the most important minerals our bodies need. It is stored mostly in bone. Magnesium is important in the function of many of the body’s systems including blood sugar, metabolism, muscle and nerve function, and blood pressure. Cucumbers are not just good for gaining necessary nutrients, but are also excellent for snacking. Having next to no calories, sodium or fat, they provide a filling, healthy snack without risking packing on the pounds. When you are feeling tired in the afternoon, put down the caffeinated soda and pick up a cucumber. Cucumbers are a good source of B Vitamins and carbohydrates that can provide that quick pick-me-up that can last for hours. Looking to fight off that afternoon or evening snacking binge? Cucumbers have been used for centuries and often used by people for quick meals to thwart off starvation, because they store well. • The meat of the cucumber is excellent for a cooling touch on tired eyes. Cool, fresh slices of cucumber are perfect for a quick spa treatment. If the cucumber has been refrigerated, the coolness will alleviate puffiness and under-eye redness, while the hydrating properties will reduce fine lines and wrinkles. 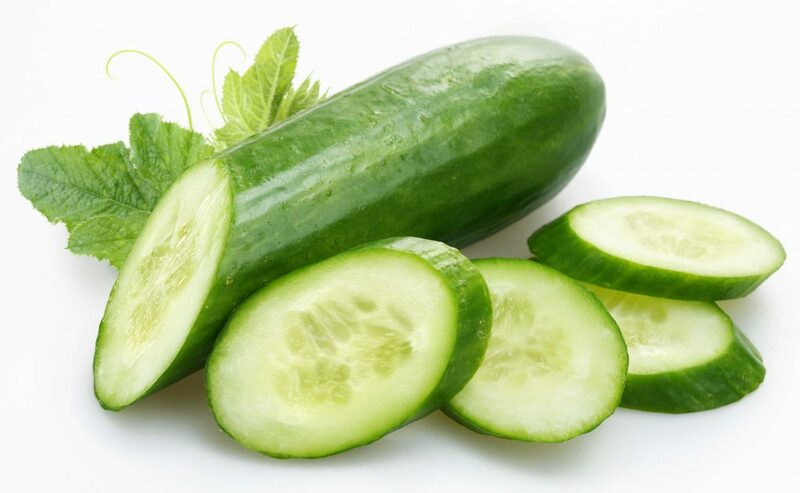 • Cucumbers are purported to be a quick way to minimize the appearance of cellulite? Rub a slice or two of cucumber along your problem area for a few minutes. 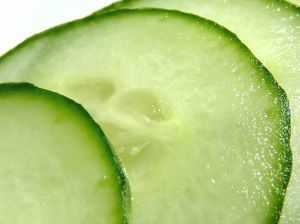 The enzymes in the cucumber will cause the outer layer off collagen to firm and tighten and reduce the visibility of cellulite. This works well for reducing the appearance of wrinkles as well. • If you want to avoid a hangover or terrible headache, eat a few cucumber slices before going to bed and wake up without the traditional headache and groggy, flu-like symptoms. Sugar, B vitamins and electrolytes in the cucumber replenish nutrients the body loses, keeping everything in equilibrium, avoiding a hangover and the ensuing headache. • When you are stressed out and don’t have time for massage, facial or visit to the spa, cut up an entire cucumber and place it in a boiling pot of water. The chemicals and nutrients from the cucumber react with the boiling water and is released in the steam, creating a soothing, relaxing aroma that has been shown reduce stress. • When you have just finished a date and realize you don’t have gum or mints you can take a slice of cucumber and press it to the roof of your mouth with your tongue for thirty seconds to eliminate bad breath. • According to Christina Venessa Becherer of Livestrong.com, the skin of the cucumber is just as nutrient-packed as the meat, and is a good source of fiber, imperative to good digestive system function. Long overlooked as both a food and remedy source, cucumbers are an inexpensive, simple staple to keep around the house for snacking, quick home remedies and as an alternative to expensive, harsh beauty products. The next time you are looking for a quick, low-calorie snack, or a natural home spa treatment, try the lowly cucumber. Trina L. Grant is an award-winning professional freelance writer specializing in health and wellness topics. She enjoys sharing her knowledge of healthy lifestyles with others. Check out more about health and wellness on her website.